It’s a story about nine undelivered letters due to the negligence of Aron Paris, a postman who has an athletic body, black hair, and clean shave oval face and Sara Marcos love of his life. After 23 years of their married life, they shift to some other place; while shifting Sara found a black leather bag of Aron covered in layers of dust with few undelivered letters. Aron immediately understands the blunder he had made. An uninvited pain had enveloped him. He forgot to deliver the letters and thinking of those people who waited for this letters make him feel guilty. He decided to deliver the letters he should have done 20 years ago. While delivering letters Aron experience so many emotions at the same time. It needs the courage to accept mistakes and apologize for them but Aron has that courage and determined to correct his mistake by delivering the letters to their recipients. Carl, Samuel, and Cathy were three recipients of those undelivered letters. The letters left a huge impact on their lives. The way Cathy waited for her husband and took care of their daughter, Kara. Samuels's love for Elizabeth and the way this letter shook Samuel's life. The Carl had an impact on the life of Bakintin Lenit and the way he shows the right path to Lenit was my favorite part so far. Each and every emotion is written in a very magnificent way that it will touch your heart and anyone can easily relate or live their lives while reading. The author does justice with each character and portrayed in a very manageable way. 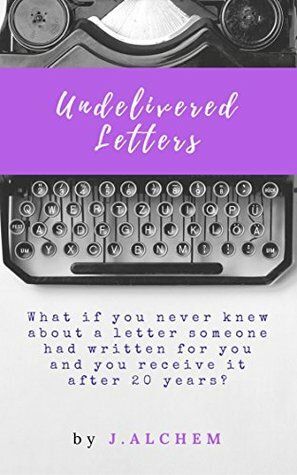 It's in a Kindle version now having the story of only three undelivered letters and will be out soon as a paperback with remaining letters and their stories. We are living in an age of technology where people usually don't write letters but for me, it's a treat to read this and experience such a beautiful emotion. I would definitely recommend this to all. It's a roller coaster ride of emotions and I'm eagerly waiting for the other letters to read as soon as they available. It's worthy of your time. I got this book to review by author. 1. The love of an adventurer towards book was inexplicable. We did not have our favorite people around, but we did ensure we had books to accompany us to those places. 2. Sometimes you get stuck and it took days for you to find a way through the lurch, landslides and natural calamities. It is the life of a mountaineer. 3. You don't choose the novels, they choose you. 4. A perfect revenge would be ensuring that no writer commits suicide after rejection. Book Review: Can Love Happen Twice?